So, for over three years now, we have been the proud parents of one, and now two, boys. As I reflect over these last three years, I think two things stand out to me most. First, I never expected parenting and having kids to be be filled with so many highs and lows. And much of the time, the lows coming right after really fun highs. For instance, we’re all sitting around and playing with the boys, and Charlie says some tender, loving, cute thing about our family or Sam – a parenting high. Not more than 10 seconds later, Charlie is hitting Sam, and chaos ensues with Sam screaming, then Charlie getting disciplined, which leads to Charlie screaming, which leads to Sam screaming more because Charlie is screaming. So, all of the sudden, this lovely picture-perfect family moment is followed by a parenting and child low. The second thing that we have really found out is that we are so tired. This goes without saying, as we think about it now, but it was easy as a couple without kids to look at friends that had kids and wonder why they were so tired all the time. I mean, come on, I know raising kids is hard, but is it really that tiring? I feel like you’re being a little dramatic. Well, we found out that it is really that tiring, and, no, they weren’t being dramatic. Then, add something like living cross-culutrally and in a developing country, and it’s down right exhausting. Just then, with about 45 minutes before we were to land in London, Sam started to inconsolably scream, and then the flight crew turned on the lights to serve a quick breakfast, and Charlie was forced awake so fast that he really freaked out. It was probably the most we’ve ever seen him lose control with crying and violent coughing until he threw up. (Thankfully, we had a change of clothes for him.) So, as all this was happening, one of the flight attendants was holding a screaming Sam as other flight attendants tried to help us console Charlie and get him cleaned up. It was quite a scene with everyone in the plane looking forward or backward in our direction. I’m sure, for some people, we will also be the story they tell their friends about being on an international flight with children. But 10 minutes before we landed, both boys calmed down and landed like nothing had happened. However, it took Kristin and I a while to get un-traumatized by the whole thing (and, I think, the rest of the passengers). So, there you have it, a case study in parenting highs and lows. Or maybe a case study in pride comes before a fall. I learned that, with international travel with children, it’s not over until it’s really over, and you are at your destination. 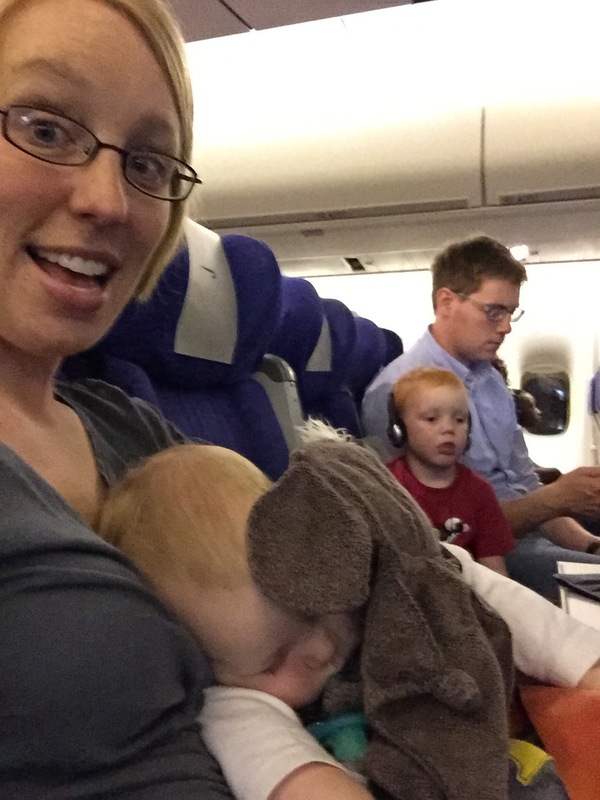 This entry was posted in Family, Travel and tagged highs and lows, parenting, Travel Stories. Bookmark the permalink. I love your stories! You did good! You are both awesome parents. Hang in there.